There are a number of teeth replacement options available today. However, none are as successful as dental implants. A single dental implant and an implant-supported crown can reliably replace one missing tooth and restore your bite to full function. At our Albuquerque, NM, practice, Dr. James Slaman can provide an implant-supported crown with no need for outside referrals. Depending on your case, he can perform each step of your treatment from preparatory procedures to the placement of your final restoration. Who Is a Candidate for an Implant-supported Crown? Even one missing tooth can have a negative impact on your bite and overall oral health. Therefore, we always recommend replacing missing teeth. 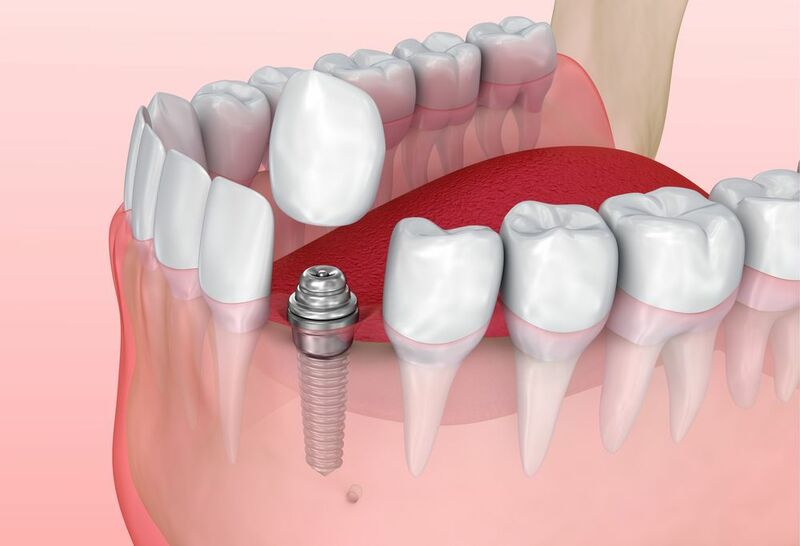 Patients who need to replace a single missing tooth can benefit from one dental implant and an implant-supported crown. Qualifying individuals will be free from decay and gum disease and have sufficient jawbone density to accommodate the implant post. During an initial consultation, Dr. Slaman will let you know if a dental implant is the right treatment option for you. Given today's technology, dental professionals now recommend implants as the most optimal teeth replacement option. Treatment planning: The most important phase of dental implant treatment is the planning stage. During an initial consultation at our practice, Dr. Slaman will assess the health of your teeth and gums, as well as capture images of your jawbone using our GALILEOS® ComfortPLUS cone beam scanner. This will allow him to thoroughly evaluate the health and density of your jawbone. Preparatory procedures: Some patients may have inadequate bone density for the dental implant. In these cases, treatment eligibility can be increased with a preparatory procedure, such as a bone graft or sinus lift. Those who undergo this type of regenerative treatment will require four to six months of healing before the implant can be placed. Surgery: During an oral surgery procedure at our office, Dr. Slaman will strategically place the dental implant into the jawbone. Healing and recovery: Once the implant is placed, it will require approximately four to six months of healing. During this time, osseointegration occurs – a process in which the natural bone tissue fuses to the implant post. Restoration placement: After the implant has fully integrated with the jawbone, you will return to our office for another appointment. During this visit, Dr. Slaman will place your custom-made dental crown to the implant post. Before the advent of dental implant technology, a single missing tooth was replaced with a traditional dental bridge. While effective for restoring your bite, a traditional bridge requires alteration of natural healthy tooth structure. In contrast, an implant-supported crown is a one-tooth solution to a one-tooth problem. Additionally, dental implants mimic natural tooth roots, actively preserving the jawbone and preventing further bone deterioration. Therefore, dental professionals now recommend implants as the most effective and beneficial teeth replacement option. If you need to have a single tooth replaced, an implant-supported crown could be the right solution for you. To explore your treatment options, schedule an appointment with Dr. Slaman. You can contact us online or call our office at (505) 881-7586.